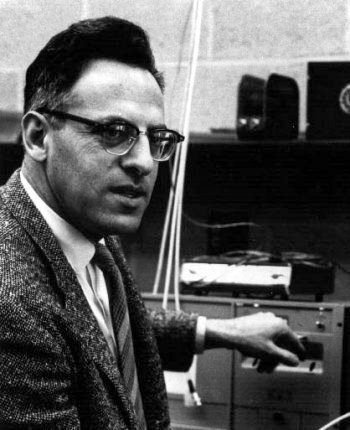 Frederick Reines (1918-1998) was an American physicist. Reines received his Ph.D. in physics in 1944 from New York University. Richard Feynman recruited Reines to join the Manhattan Project at Los Alamos. He worked in Feynman's T-4 (Diffusion Problems) Group, in Hans Bethe's Theoretical Division. He stayed on at Los Alamos National Laboratory after the end of the war, becoming the head of the T-1 (Theory of Dragon) Group, which developed a machine to attain short bursts of criticality. He also participated in and wrote reports for several nuclear tests, including Operation Crossroads, Operation Sandstone, Operation Buster-Jangle, and others. In 1951, he directed the Operation Greenhouse nuclear tests in the Pacific. He later lobbied for underground nuclear testing, and was a member of the JASON advisory group. In 1956, Reines and Clyde Cowan experimentally confirmed the existence of the neutrino. In 1995, they were awarded the Nobel Prize in Physics for the discovery. Reines was praised for being "so intimately associated with the discovery of an elementary particle and the subsequent thorough investigation of its fundamental properties." 1918 Mar 16th Born in Paterson, NJ. 1939 Received BS degree in mechanical engineering from Stevens Institute of Technology. 1941 Received MS degree in mathematical physics from Stevens Institute of Technology.